It always amazes me when I hear how hard it is for black kitties to find good homes. There is something so magical about them!! Last year I lost my precious black cat, Dickens. He had such a soaring spirit – it filled our home with love and laughter. And just a few weeks ago I had to say goodbye to Sammy, the outside black kitty I’ve been feeding for 8 years. One day he didn’t show up, right around the time a very large coyote started prowling through the neighborhood. The loss of these two precious kitties has left a huge hole in my world – both inside and outside my home. 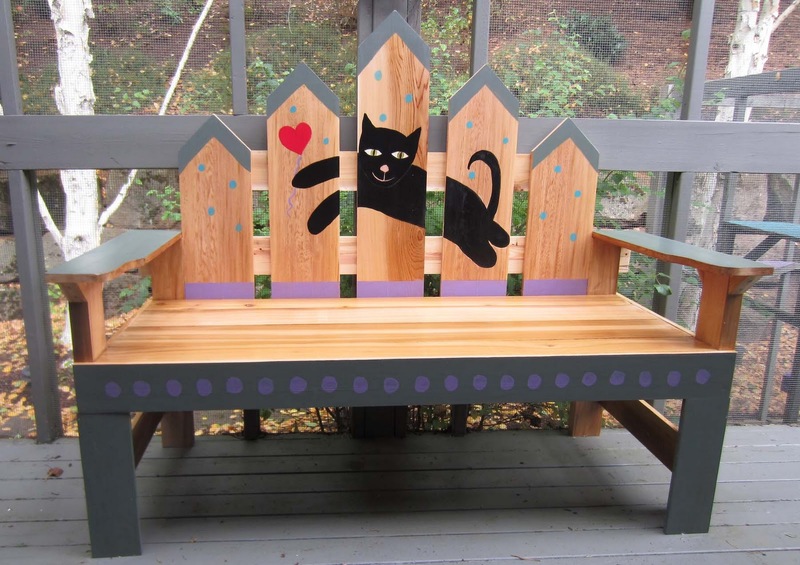 I thought it would be fun to celebrate my dear furry friends with this bench, which I painted in their memory. I’ve told my black cat, Star, and her sister, Molly, that they are most welcome to sit on the bench – Dickens and Sammy would want that. Looking at this bench makes me smile…Dickens and Sammy would want that, too. I love the black kitty on your bench, but am terribly sorry for your loss of Dickens & Sammy. I rescued a black cat who had lived outside the apartment I was living in for a year. She would never let anyone touch her. I lost two kitties two days apart to violent deaths (one was a pit bull and another was hit by a car) and right after my neighbor had buried my second kitty, this black cat walked right in through my open window and started crying her head off. I immediately named her Sarah and that poor kitty just needed love desperately. I took her under my wings and gave her that love and babied her for almost 6 years before I tried to have surgery to save her life, but they had to put her to sleep on the operating table because her liver was riddled with cancer. I never had the chance to say goodbye, but I brought her ashes home and they sit with the ashes of many of the other babies I have lost over the years. Yes, it’s true that people don’t like to adopt black cats or dogs and it’s bizaare that I have had 2 black dogs (I currently have a black mini-poodle named Blazer) and the dog before him was a black doxie named Drucy. I have no idea why people would be so prejudiced against black animals, but they are, and I’m glad to say you and I are not one of them. Again, my condolences to you for the loss of Dickens and Sammy. With love, Blazer, Kitty Kimber & Mom, Vicki T.